One of my “must-do’s” for visiting Disneyland for the first time was trying the highly touted Monte Cristo sandwich. 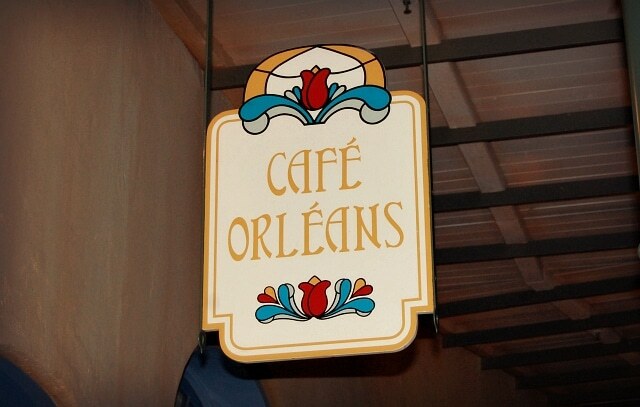 This sandwich can be had at either Blue Bayou or Cafe Orleans, both located at New Orleans Square in Disneyland. I chose to eat my first Disneyland Monte Cristo at Cafe Orleans simply because it was cheaper and I wasn’t looking for a fine dining experience. 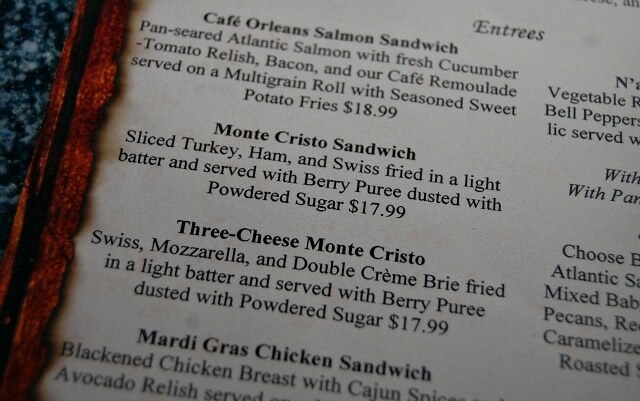 The Monte Cristo at Blue Bayou is $24.99, versus $17.99 at Cafe Orleans. I’m sure you can’t go wrong with either one! So, what’s exactly in the Monte Cristo at Disneyland? To put it simply, the Monte Cristo is a battered and fried ham, turkey and Swiss cheese sandwich, sprinkled with powdered sugar and served with jam for dipping …heavenly, right? It’s as decadent as you’d imagine. I’ve waited a long time to try this sandwich and it did not disappoint. All the hype is true. The combination of the ham, turkey and Swiss with the battered breading and powered sugar is perfection. It’s an interesting combination that totally works. The only thing I wasn’t sold on was the berry puree, which was just a little too thick and sweet for my liking. 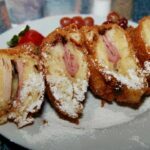 Because I couldn’t just leave you drooling at that photo of the Monte Cristo, here’s the official recipe for the Disneyland Monte Cristo sandwich for you to recreate at home. You’re welcome. 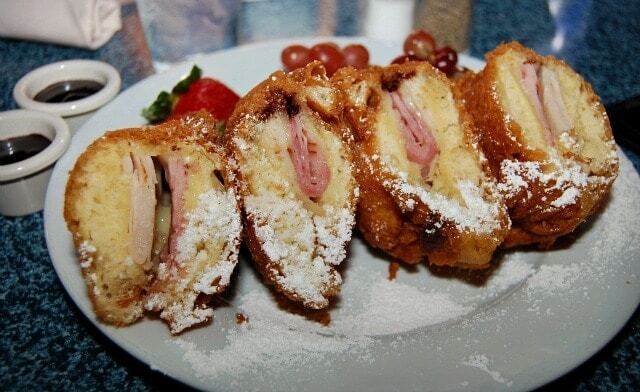 Have you tried the Monte Cristo at Disneyland? This looks sooo good! I was a Disneyland in June but I didn’t get a chance to eat here. hopefully if I ever make it back I will get the chance. this sandwich is so amazingly delicious! 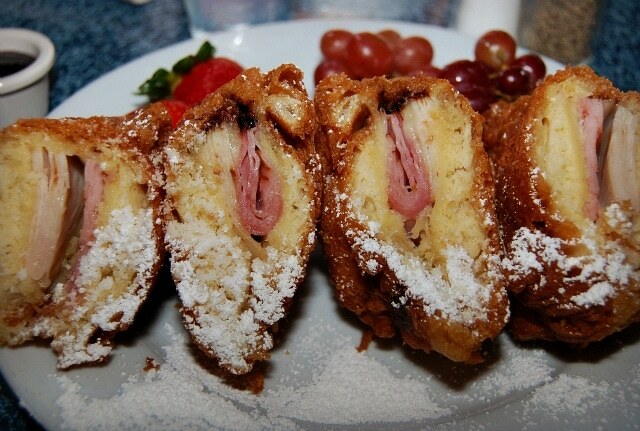 I’ve never eaten a Monte Cristo sandwich before… looks so yummy! yes! I do need to make those! YUM! I love The Blue Bayou! There’s one with just cheese!! Oh my I want one right now that looks amazing! My Father would destroy this. Thanks for sharing the recipe for that sinfully delicious looking treat! Whoa, how interesting. I don’t like Swiss, do you think it would work with a different kind of cheese? You can use whatever cheese u like however I am a Swiss eater but honestly the paodwt sugar and jamvand whatever the white pudding is it counteracts the Swiss big time I didn’t taste the Swiss as much. That looks so sinful and oh so good! My husband would love this and we are heading to Disneyland tomorrow! Wow that looks amazing. I’ve never heard of it before and I’ve been to Disneyland so many times. I love the mix of sweet and savory. I’m sure it’s to die for! Oh, that looks so freaking good! Yum! I have to make this for Hubs! We’re planning a trip to Disney now so I will be sure to put this on my list of places to visit. I love the Monte Cristo sandwhich from Disneyland! No other one has come close to theirs!! However, no recipies seem to match up to their breads crispyness and flakyness! It’s typical to see recipies with white bread slices but none seem to come close to the almost deep fried pocket Disneyland makes! How do they cut and prepare it?! Any suggestions or secrets would be appreciated!